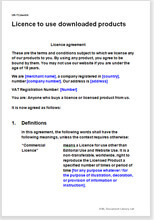 This agreement is perfect for a website selling photo images, architect’s drawings, computer games and so on. It is assumed that you will want to differentiate prices by some formula or other. It provides explicitly for different prices for different uses. You might invite the licensee to buy for either marketing use (highest price), commercial use, or editorial use (lowest price). In that way, the user sets his price and you can police the use if you wish to do so. The point is that you capture all the sales at prices your customer will find acceptable. This option can be deleted easily if not required. You can alternatively price by reference to some formula. The point is that differential prices can be used. The agreement assumes that some or all of the items you sell will be owned by a third party with whom you have made some arrangement. You may therefore be selling your own photo images and those of third parties with whom you have made arrangements. The agreement provides for renewal payments, so you can use it for a single payment as a one-off or a payment which is annually renewable. Many soft products require backup or support of some sort, in a hard medium, most usually a DVD or CD. The agreement covers that too, with provision for the distance selling regulations, delivery, returns and so on. Again, there are many simple options, for example as to: sub-licensing, copying, removing ID references, prohibited uses. You do not need to add anything. You simply delete what you do not need. This agreement is suitable for software too, but a simpler version is at Software licences, sales and EULAs. If you have an interface with site users in which they could damage your site or reputation by immoral postings or testing your security you may be better with TandC downloaded products: full separate licence agreement; B2B and B2C. That agreement provides very extensive menus from which to choose your protection and regulation levels. Other legal areas covered for your protection and efficiency. Over 1,300 words of helpful drafting notes.